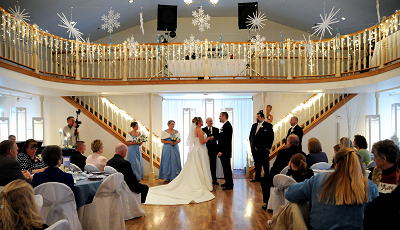 The historic Grand Ledge Opera House is the perfect location for weddings, receptions, holiday parties, special banquets, balls, reunions, and business meetings with ample free parking. It is located in downtown Grand Ledge alongside the Grand River. Our office hours are Monday through Friday from 9:00 AM to 5:00 PM. Evening and weekend tours can be arranged by special appointment. The building which is situated in downtown Grand Ledge on a beautifully landscaped area along the Grand River provides a picturesque setting for weddings, receptions, large gatherings, and community events. 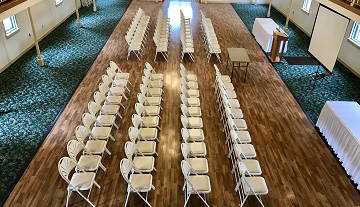 The Grand Hall on the main level and the Terrace Level with its large outdoor patio area and grounds are available to rent separately or as a single package to fit your needs. Our stunning venue provides a picturesque setting for weddings, receptions and other large gatherings. The Grand Hall on the main level will accommodate 240 guests reception style. The Terrace Level accommodates up to 140 guests and offers beautifully manicured gardens, a charming gazebo and a large patio that is perfect for wedding ceremonies. Our annual concert series include a variety of local and area musicians in addition to some national and international performers. In the past we have showcased Bob Milne, a renowned ragtime pianist; John Two-Hawks, an Oscar nominated Native American flute player; vocal artists like Three Men and a Tenor; and upcoming young artists like Taylor Taylor. 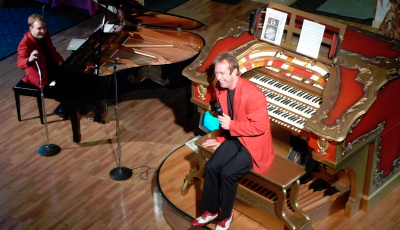 The Grand Hall is home to the 1928 Barton Theater Organ with four concerts each year. Silent movies are even accompanied by the Barton Organ playing for re-creation of past years entertainment. The Grand Ledge Opera House is located close to Lansing and the state Capitol, but it is set on spacious and serene grounds along the Grand River. With a total of 6,000 sq. ft. of meeting space divided between three rooms, our charming downtown location provides a friendly backdrop for your corporate meetings, lectures, annual dinners, and non-profit fundraisers. The Blake Room located above the Opera House office area is a large meeting space with an executive boardroom table and chairs suited for smaller events such as board and committee meetings or other intimate gatherings.